Would you like to show your work to a group of passionate photographers and enthusiasts and gather feedback at the same time? Then join us for a lively evening of conversation on rotating themes, held regularly and led by invited guest hosts. We provide some food and drink, and everyone is welcome to bring refreshments, too. Anyone can attend and participate in these free events, no reservations needed. However, only PRC members can present work (join here and see the presenting Guidelines below). To sign up to present your work, email nights@prcboston.org, and please include “SIGNUP FOR NIGHTS: (Month’s Theme)” in the subject line. The first four people to sign up will have a chance to show their work; first come, first served. “The evening was a very rich program . . . just amazing. Nights presenters may only show work at one Night per season in order to allow for a variety of presentations and we request that presenters work aligns closely as possible with the monthly theme. Presenters may show either prints or digital files using the PRC computer and room projector. Please be prepared to speak about your work/project for approximately 7 minutes with audience discussion and feedback afterwards. Each presenter’s time slot cannot exceed 15 minutes. Please limit the number of images to 20. If you are showing digital files, please bring your images or slide show on a portable USB flash drive, CD, or external hard drive and plan to arrive at least ten minutes early so that we have time to copy the files to our computer. We can support jpgs, PowerPoint, Keynote, and PDF. Please note: If you choose to bring your own laptop, you must provide the proper VGA adaptor to connect to the projector. —Ken Karts shows his work during a special Nights, “Lo-Fi and Slow Photo,” held in conjunction with the Somerville Toy Camera Festival, September 2016, hosted by Jim Rohan. 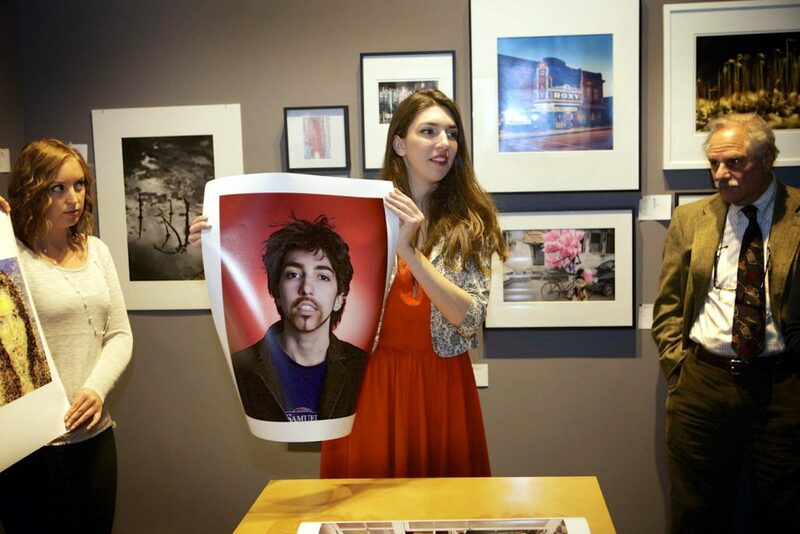 —Renée Kristine Ricciardi shares her work at “Identity and Portraiture” Night, January 2014, hosted by Caleb Cole.